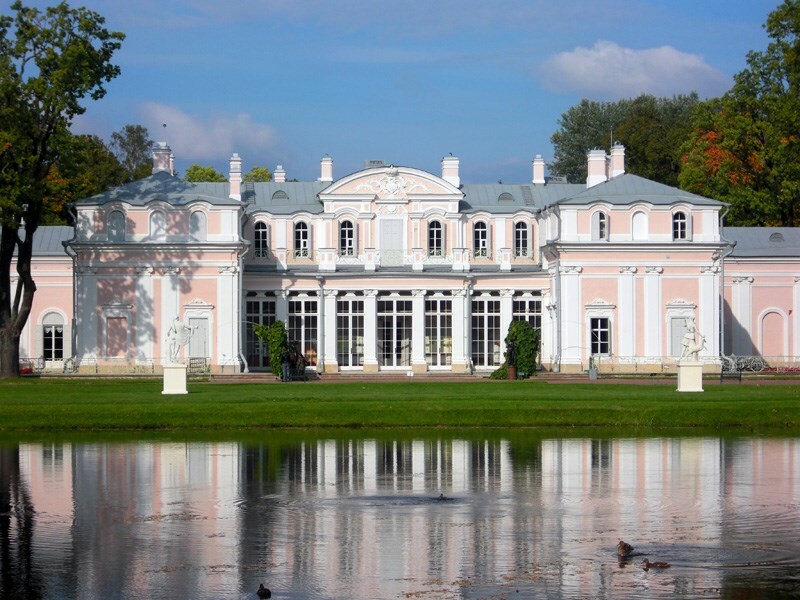 The Chinese palace can be deservedly called the treasure of the park in Oranienbaum. The name "Chinese" appeared for the reason that in the 18th century, during the time of Catherine II, the art of the Celestial Empire (the style of the chinoiser) became popular in Europe and several halls of the palace were decorated using oriental motifs. However, the art of China was very freely interpreted by the artists of that time. The value of the palace is that it has retained the original interiors of the XVIII century (unlike other royal residences in St. Petersburg, which were destroyed during the Second World War). Perhaps, that is why the Chinese Palace is open for visiting only in the summer, at the rest of the time it is closed, as cold and wet air has a destructive effect on interior materials. The Chinese palace was erected in the Upper Park in 1762 - 1768.Initially, the building was one-storied and its originality consisted in the fact that the exterior decoration, as well as the interior decoration, were made by one outstanding master - the Italian architect Antonio Rinaldi. The building is built in the style of rococo, for which (in contrast to the more magnificent and pompous baroque) is characterized by refinement, sophistication and delicate taste. The Chinese palace was created not for official receptions, but for rest and entertainment of Catherine II and those close to her. The exterior design of the building was rather restrained and it looked more like a summer pavilion than a palace. At the same time, the interior decoration surprised with its beauty and luxury. In total in the Chinese palace there are 17 halls, dances were in them, people played cards and arranged feasts. Moreover, each room was decorated in a peculiar way and differed from all the others. As decoration the gilding and mirrors, stucco molding and painting have been used. The main front enfilade (the main axis of the building) includes the Hall of the Muses, the Blue Living Room and the Glass Cabinet, the Great Hall and the Lilac Living Room, the Small and Large Chinese Cabinet. Perpendicular to the front enfilade are two wings. In the east wing there were rooms of the Grand Duke Pavel Petrovich (Pink Drawing Room and Shtofnaya Bedchamber, Boudoir and Cabinet), in the west - the rooms of Catherine II (Chinese bedchamber and Portrait, Dressing room and Camerungferskaya - room for the duty of the court lady). To decorate rooms in the oriental style, many art objects were brought from China and Japan. In the palace there are art objects of the 18th century - paintings and porcelain collections brought from the east and from Europe, carved gilded furniture created by Russian carvers and gilders according to Rinaldi's drawings. Particular attention deserves parquet, featuring a variety of patterns and colors.Initially, the floor in the rooms was made of marble, and in 1770 it was replaced with a set parquet, for the creation of which was used more than 20 species of trees, among them - red, black and brown wood, as well as boxwood, amaranth and Persian nut. In 1850, the entrance to the building was moved to the east side, where the Great Antikamera, which served as the Antechamber, was annexed. Excursion to the Chinese palace begins with this room, a kind of anteroom. There is a monitor installed and while the group is gathering together, you can see a film about the history of the palace. At the door leading to the next hall of the Muses, cast-iron floor lamps of the 19th century in Paris are installed, earlier they stood on the porch at the entrance to the Anticamera. Behind the Anticamera the Hall of the Muses follows, it is often called the Scenic Gallery.Its walls are decorated with paintings of the Italian painter Stefano Torelli, depicting Apollo with cupids and nine muses embodying art. On the plafond you can see the goddess of beauty and love Venus and her companions of graces. The decoration of the glass cabinet is the most original. The hall is decorated with twelve panels embroidered with bugles (long beads of tubular form). On the glass-bead base, embroidery is done with fluffy threads, depicting exotic plants and birds on the background of fairy-tale landscapes. Each panel is separated from the neighboring by carved gilded frame.There are no analogues to the glass cabinet in the world. Initially, the walls of this room were decorated with blue silk, so the Living Room is called blue. Later dilapidated material was removed, and on the walls the canvases of the Petersburg artist Alexander Beideman, created in 1862-1868 were placed. The plafond of the pink drawing room with the image of Diana is painted by the Venetian painter Gasparo Ditsiani. The decoration of the living room is also two picturesque panels depicting Cupids. Earlier the room was decorated with the ceremonial and chamber portraits of Catherine II. According to legend, in this room a little Paul, the son of the Empress was often playing. In former times, the Wardrobewas decorated with elegant furniture and paintings. Now here you can see only the fireplace and the gently-blue colored walls, decorated with carvings and moldings. The Great Hall is the main building of the Chinese Palace, also it was called the Reception and Oval Hall (the room has the shape of an ellipse). The hall is located in the center of the main front suite. The big hall served for reception of visitors and consequently its registration differs by severity and solemnity. The height of the room is 8.5 meters, it uses artificial marble of various colors and painting, stucco molding and mosaic. The presence of columns makes the interior somewhat classical. The front room was originally a vestibule; guests entered it from the central entrance. Their admiration was caused by everything around - a parquet floor similar to a carpet, the walls painted by Stefanno Torelli and the picturesque plafond "Apollo and Art" (his authorship is attributed to Serafino Barozzi and Stefanno Torelli).